What is going on with that project, anyway? Sometime next year we hope to be breaking ground on the first phase of Oregon City’s future riverwalk; one that will weave through the former Blue Heron paper mill at the edge of the Willamette River and provide a prominent view of Willamette Falls. If you’ve been following the project, you likely know about—and may have even participated in—the public process that helped shape the riverwalk design we unveiled at OMSI in 2017. So when will you actually see something happening at the former mill site? Read on to find out what’s gone on behind the scenes from the time the community shaped their vision to shovels, or—probably sledgehammers—hitting the ground. The riverwalk design process provided multiple opportunities for the public to participate. We held five large-scale community events, provided opportunities for online feedback and held dozens of tours, presentations and community conversations. In all, thousands of Oregonians shared their vision for a public riverwalk at Willamette Falls. After the conceptual riverwalk design was completed and unveiled in mid-2017, Metro staff got to work drafting a master plan, which included the new riverwalk design, and laid out the long-term vision for guiding future development and public use of the riverwalk. The master plan was adopted by both the Metro Council and the Oregon City City Commission in early 2018. While project staff were hard at work on the master plan, they were also engaged in conversations with the owner of the former mill site. You might recall the Blue Heron paper mill was purchased out of bankruptcy in 2014 and the owner granted Metro, on behalf of the Willamette Falls Legacy Project, an easement to build a riverwalk at Willamette Falls. Permitting agencies, like the US Army Corps of Engineers, require that property owners sign the federal permit applications. After many months of conversations and a delay in the project schedule, the property owner signed the applications necessary for us to get the lengthy riverwalk permitting process underway. Section 106 of the National Historic Preservation Act, in short, requires federal agencies to consider the effects of federally funded projects on historic properties and culturally significant sites. Once the Willamette Falls Legacy Project submitted permit applications it allowed project officials to continue conversations, but more formally, with local tribal governments. There will also be a public comment period and we will share that opportunity when it is available. Permits were submitted, so now what? The US Army Corps of Engineers has had an opportunity to provide a preliminary review of the more than 700 pages we submitted, and they have requested that we refine the permit drawings and resubmit the application. Because of the complexity of this project, we anticipated receiving requests for additional information to make our application complete and we’re working to fulfill those requests. In the fall, we issued a request for proposals seeking a team to transform the conceptual design for the first phase of the Willamette Falls riverwalk into detailed permitting and construction drawings. We received four proposals and are working to select a team now. The new design team, once under contract, will help to complete the additional documentation required to resubmit the riverwalk permit application and continue the permitting process including, Local Land Use and Building Permits. We’ll also issue two separate requests for proposals. One for a Construction Manager for General Contractor and one for Historic and Cultural services. When are those sledgehammers hitting the ground? The Willamette Falls Legacy Project is aiming to break ground on the first phase of the riverwalk in the spring of 2020. Phase 1 of the Willamette Falls riverwalk will include safe and secure interim public access onto the former Blue Heron paper mill site, a prominent view of Willamette Falls, habitat restoration along the riverbank and building demolition that will prepare the site for future phases. 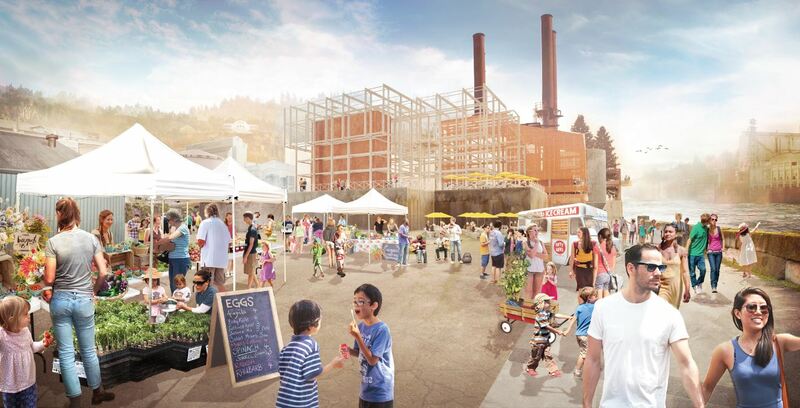 Join our email list to stay up to date on the Willamette Falls Legacy Project.